Bring in your old, broken, or unused jewelry. We will look it over, sort it for karat, and make you an offer. When you say "yes" we will write you a check. If you say "no" you will walk out with your jewelry. ​There is no fee for the evaluation. Did you inherit family jewelry and you don't know what it is? Just bring it in and we will gladly let you know what you have. We will sort the costume from the precious. 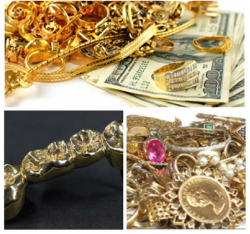 If you are looking to turn any of the precious jewelry into cash, we will make you an offer. There is no fee for this evaluation.